Ravelry is a fabulous resource to help knitters choose which pattern to knit. It's like having a knitting class and party at the same time, where only enthusiastic knitters are invited. Lately I've been amazed by the finished projects I find on Pinterest which when I link back to Ravelry, I discover a great design that for what ever reason just didn't catch my eye. 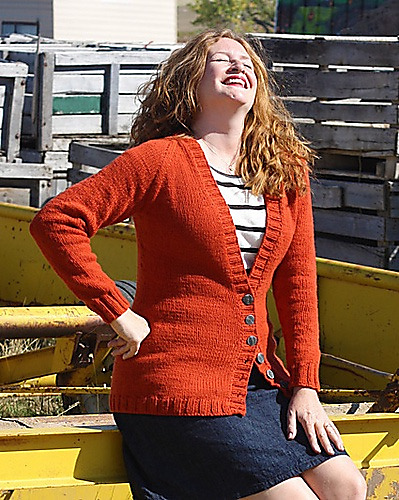 This cardigan by Stefanie Japel is a great example. (I interviewed her here.) A classic shape, clean design lines, seven sizes in the pattern. Aran weight, 100 % Merino wool. A different colour, I'm continually amazed by the way we just don't see past colours we don't like. Yarn substitutions, the good, the bad and the ugly. Colour patterns (striping, variegated yarns and colour blocking) or stitch patterns (cables and lace) added to the basic design. There was one version with multiple colours, textures and yarns. Specific fitting or preference issues. The original design has a deep v neckline. I love a deep v if the garment will always be worn over another garment. If I wanted to wear it alone, done up, I'd want a higher neckline. That's an easy modification. Study the project photos. There are some bands which are too long, some are too short and some are just right. The mix of all three tells me it's the knitters,not the pattern. If all of the bands were too short, I'd know to watch for that problem when I did my band. Look at the different lengths of the various projects. I saw everything from cropped to high hip and all the way down to mid thigh. There were different sleeve lengths on some projects. Do you spin? There are 7 projects with hand spun yarn. I noticed the neckline seemed to have an issue at the top, I searched the word neck in the search inside projects box. I found what the problem was and two methods for fixing it used by the posters. I also would note many projects didn't mention it, so decide for yourself if it would bother you or not. I saw alternative band treatments, maybe you want a 1x1 sewn on rib instead, The project page included a how to. Look for photos of the garment on bodies rather than hangers or laid flat. If you find examples with your proportions, even better. You will have a more realistic idea of how the sweater will flatter you. Expectations play a big role in how happy you will be with the end result. I'm convinced some of our dissatisfaction with clothing is due to skinny tall models. I follow quite a few What I Wore style blogs and I'm noticing a really positive effect on my expectations regarding my own appearance. What about a mash up of two patterns? I saw some of those too. Checkout the great buttons on projects. Figure out if you want buttons that blend or buttons that stand out. Skip the buttons and use a shawl pin instead. Check out how other knitters style their sweater. You might get some alternative ideas. Thanks so much for this interesting, informative newsletter!